Bullying is a topic we parents hope we don’t have to look square in the eye. 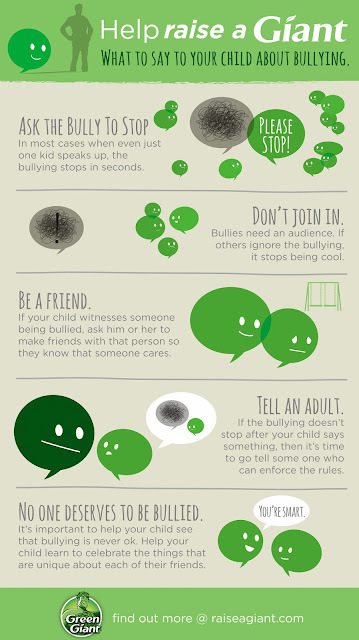 We hope that our kids never get bullied or become a bully. But in today’s performance driven world, it seems it is less likely that all children won’t be touched in some way by bullying. Even if they just witness bullying. So how do we help our kids help themselves? How do we equip them with the necessary tools they need to survive and thrive? 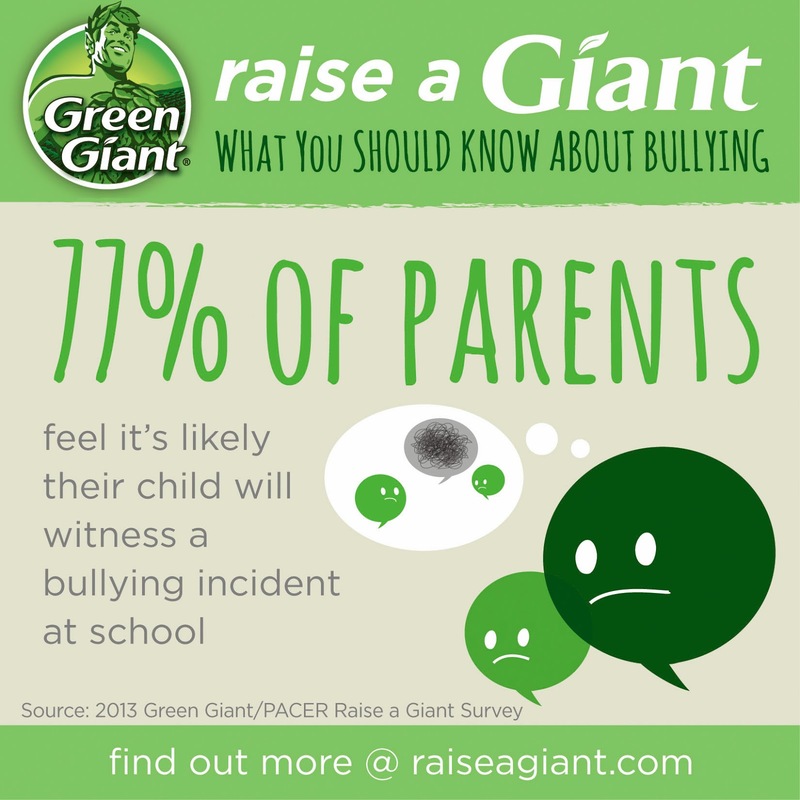 Green Giant’s Raise a Giant campaign offers wonderful tips and insights to help parents and kids face bullying together. I chose not to publicly write a letter to my daughters because they have asked that I keep personal details about them and our lives to a minimum online, but I do talk about this tough subject with my girls. I invite you to learn more by visiting Raise a Giant where you can read letters from parents, watch their helpful video and join in. As always, I hope you found this post helpful. I invite you to share in comments if you've had to talk with your kids about bullying . 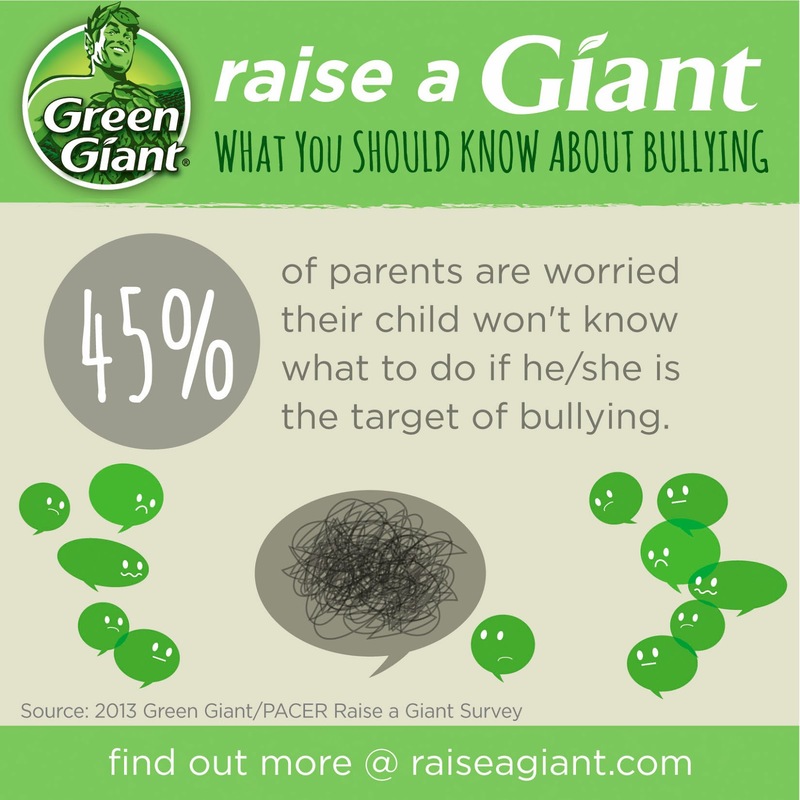 Disclosure: The information and prize pack have been provided by Green Giant® through MyBlogSpark. Thank you General Mills for making a $25 donation in MY WAHM Plan's name to the Pacer's Center for Bully Prevention. This is such a lovely campaign! Terrific advice! We certainly need to keep the conversation going! Conversation is key isn't it? I agree that this is a lovely and needed campaign and I'm honored to be a part of it. I saw your post about it as well! This is a great campaign! It's such a good cause that I appreciate as a parent. I agree. As a Mom of 2 daughters, I found this campaign helpful in not only keeping conversations open with them- but also seeing that other parents echo some of my concerns as well. What a great cause to be involved in. Bullying is such a horrible problem. I love that Green Giant is getting behind this problem and bringing awareness to it. I bought their veggies the other day just because of this campaign. I am having open conversations with my kids about bullying. I ask them about what is going on at school and if they ever see it happening. I want to nip it in the bud if it starts up. What a wonderful campaign. As a former elementary teacher I am saddened to see how much bullying has increased over the years. Bullying really is getting worse rather than better in my opinion. That's why I am thankful a big brand like Green Giant decided to help. Awesome! I love that you are helping by buying their veggies. I plan on buying more today. I talk to my girls about it too. We are an open family that talk alot )sometimes over each other)- but I always try to find quite, private time with both girls so they can open up and share. I can well imagine what you may have seen in the class room and at recess. I can't believe what my 5th grader shares. Some kids are just down right ugly in their thoughts and actions. It's hard not to pre-judge their parents.